Even a small support team can give an excellent customer service with the right tool. LiveChat’s help desk software gives you both live chat and ticketing system within one app, at a price of one product. And there’s a whole bunch of additional features to optimize your team’s work. You know what your customers deal with, we’ll give you a tool to help them out. LiveChat’s ticketing system makes sure you won’t miss out on any customer’s issue. 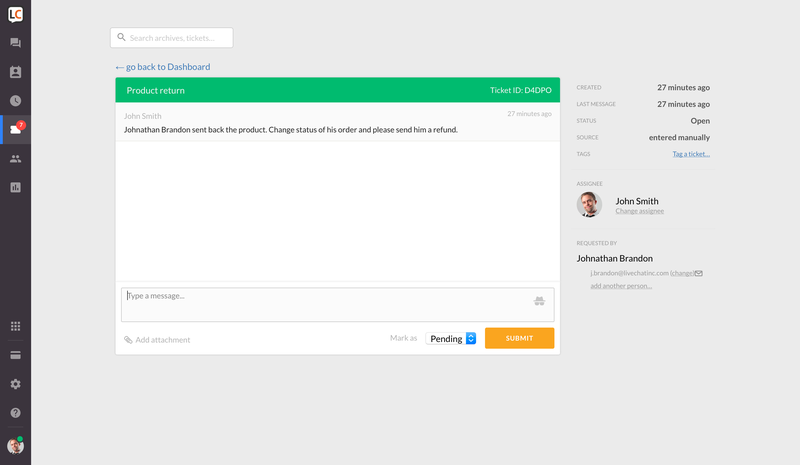 Don’t waste time – handle all support activities from one place. If a chat can’t be resolved right now, create a ticket and come back to it later. 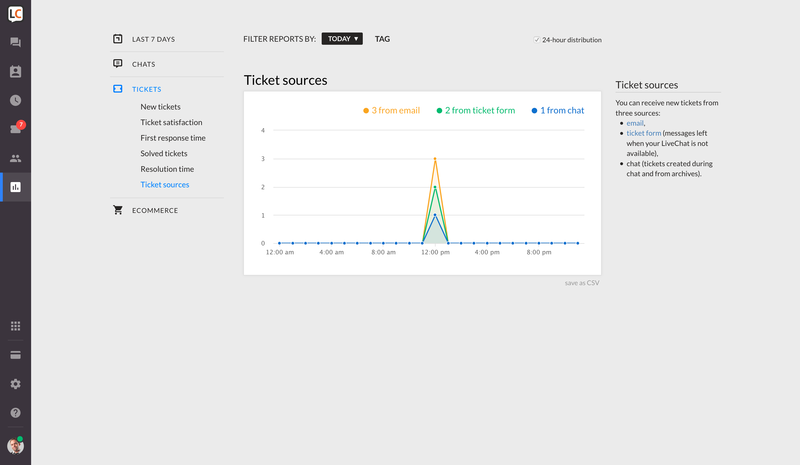 Keep your tickets organized with tags and comments, and, when you’re finished, get accurate reports to get better with every solved issue. Keep your customer service software set down to the minimum – since LiveChat’s help desk software has been built into the live chat application, you won’t have to deal with any 3rd party integrations. There’s no need to switch between different apps, and you pay for one product only. Connect with your customers via live chat and manage all issues with the help desk software to keep your customers happy and informed. Be aware what works great and what needs a bit of improvement. LiveChat’s help desk software offers you complex analytics features that will let you keep track on various metrics and get better with every customer. Monitor the performance of your chats, tickets and agents, get a staffing prediction and keep an eye on your sales activity with goals and sales tracker reports. It won’t take you more than few clicks to export all of the reports to CSV. What’s more, you can schedule daily or custom reports we’ll send right to your mailbox! LiveChat’s help desk software allows you to keep all of your customer tickets in one place with no effort. There are several ways you can get tickets in LiveChat – create them from the chat app, forward your support emails directly to LiveChat, or get them from Facebook Messenger. No more switching through channels, all in one place. Knowledge is power. LiveChat allows you to provide even better support and buying experience with visitors data like name, email, geolocation, previous chats, shopping history and many more. Gather them in help desk with the pre-chat survey or transfer from 3rd party tools with just a few clicks. What’s more, you can set up your own traffic properties to collect data valuable for your business. Don’t let your help desk support tie you to your office. Apart from using the web and desktop applications, you can help your customers out with LiveChat mobile app right from your phone or tablet. Don’t make your visitors wait – engage them on your site, chat with them or create a ticket to follow up later. We integrate with multiple apps and services like Google Analytics, Facebook, Salesforce, MailChimp, DropBox, ZenDesk and WordPress. 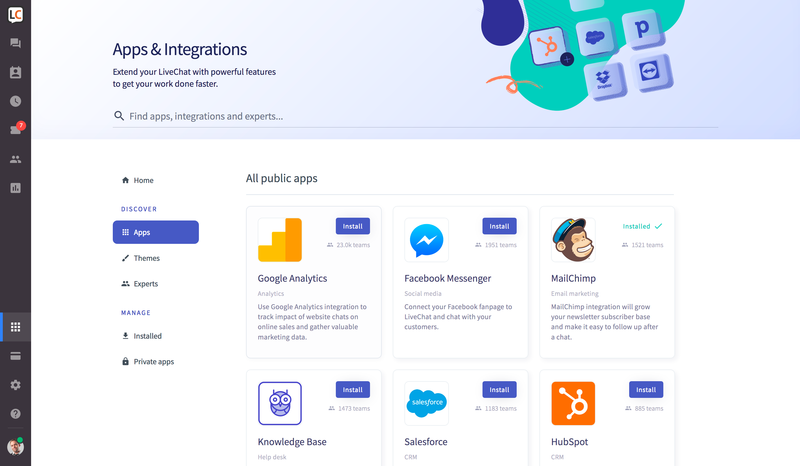 This means you can easily connect with other communication channels, add chat participants to a CRM or start your email marketing campaign. An integration with MailChimp lets you add every visitor who filled the pre-chat survey to a mailing list, so you could build a long-lasting relationship. Ask your customers how satisfied they are and make it a lesson learned. With LiveChat’s help desk software you can collect customer feedback after a finished chat or resolved ticket. For more specific information, use post-chat surveys that you can customize to your needs with specific questions, fields or, for example, a five-point scale.